While viruses don’t respect calendar years (and certainly not borders), we’re now mid-way through 2013, and it’s time to check on the status of measles and rubella globally. The United Kingdom. One of the most widely covered outbreaks this year is in the United Kingdom. The Swansea, Wales outbreak alone has led to more than 1400 cases, and northern parts of England have also recorded almost 1,000 cases. The death of a young father in Swansea was shown to be from measles pneumonia. Experts agree these outbreaks are mainly due to an accumulation of children who weren’t vaccinated as infants because of now completely discredited research published in The Lancet in 1998. In 2013, photos of anxious parents in Swansea queuing with their young children for measles vaccine was a reminder of decades long past. Wales is now reporting that emergency vaccination efforts have been largely successful, and that 95% of young people in the region have received at least one dose of measles vaccine. To bolster coverage nationwide, the UK has begun a £20 million campaign to vaccinate 1 million young people. Europe has seen a general increase in measles since 2011 with large outbreaks in France, Romania and the Ukraine. The largest outbreaks so far in 2013 are occurring in Azerbaijan, Georgia, Turkey, the United Kingdom, and Russia. Ukraine and Romania continue to record cases. A measles outbreak has been reported in Berlin, Germany, and there’s a current outbreak in the “Bible belt” of the Netherlands. The WHO’s European Regional Office has details of many of these outbreaks in its latest EpiBrief here. Europe’s outbreaks have been costly to families and to the health system and have led to a number of deaths. However, larger, more deadly measles outbreaks are occurring in countries further out of the international media spotlight. In Pakistan, the numbers of cases vary depending on the newspaper one is reading, but are reported to be as high as 25,000 and growing, with almost daily reports of child deaths. People all across the country have been affected, with particularly devastating outbreaks in Sindh and Punjab provinces. “I have been working now for more than two decades and I have not seen a measles epidemic of this severity,” a pediatrician in Lahore told the BBC. His hospital was seeing up to 70 new daily measles-related admissions. Sindh held a vaccination campaign at the start of the year, at the height of the outbreak in that province, and case counts are now dropping. Punjab is finishing a campaign aimed at reaching 11 million children in the first week of July, with some support from the Measles & Rubella Initiative. Pakistan plans to embark on a nationwide campaign in November 2013. Pakistan’s national measles vaccination coverage was estimated by WHO and UNICEF to be 80% nationally in 2012 (90% is the recommended target), and is much lower in some parts of the country. The WHO has said that three years of flooding in Pakistan has had an impact on immunization services, leaving more children vulnerable to diseases like measles. A recent video shows the efforts Pakistan health workers are making to reach children. Afghanistan too has challenges in the health sector and ongoing measles cases, though efforts to immunize children over the last year may be paying off and the country has reported fewer cases this year than it had in 2012. A UNICEF video from Afghanistan shows the impact of measles on children, and the commitment by health workers to reach them with vaccine. In Syria, a breakdown in health services due to the ongoing conflict has led to a growing measles crisis, particularly in the northern provinces. Médicins Sans Frontieres (MSF) is reporting up to 7,000 cases – whereas for several years before the conflict, Syria had almost no cases. WHO reports that vaccination coverage dropped from 95% in 2010 to an estimated 45% in 2013. UNICEF, WHO, MSF and others are trying to provide immunization services, but it’s challenging given displacements and dangers due to the conflict. On the African continent, the Democratic Republic of Congo has, once again, the largest outbreak so far this year. The DR Congo topped the outbreak list in 2011 with more than 134,000 recorded cases and in 2012 with almost 74,000 – these numbers probably represent less than one-tenth of actual cases. Already in 2013, the Ministry of Health reports 54,000 cases and almost 800 recorded deaths. The country is now planning a phased measles campaign to begin in September and reach four provinces this year, and should finish by July 2014. Several partners are contributing to this campaign, including the Measles & Rubella Initiative from the Outbreak Response Fund, UN emergency funds and the GAVI Alliance. Nigerians have also faced a large nationwide measles outbreak this year, with almost 29,000 recorded cases concentrated in the northwest but spread across every Nigerian state. Northern states responded with an emergency vaccination campaign in April, partly supported by the Measles & Rubella Initiative, though reports indicate only about one of every four children at risk received a vaccination. A nationwide campaign scheduled in October and November this year should reach approximately 30 million children under five years of age. According to the WHO’s surveillance information, other African countries with larger 2013 outbreaks include Angola, Benin, the Central African Republic, Cameroon, Congo, Ethiopia, Gabon, Kenya, Mali, Sudan, Togo and Uganda. (Note this global data represents official reporting from countries and actual case number may be much higher). 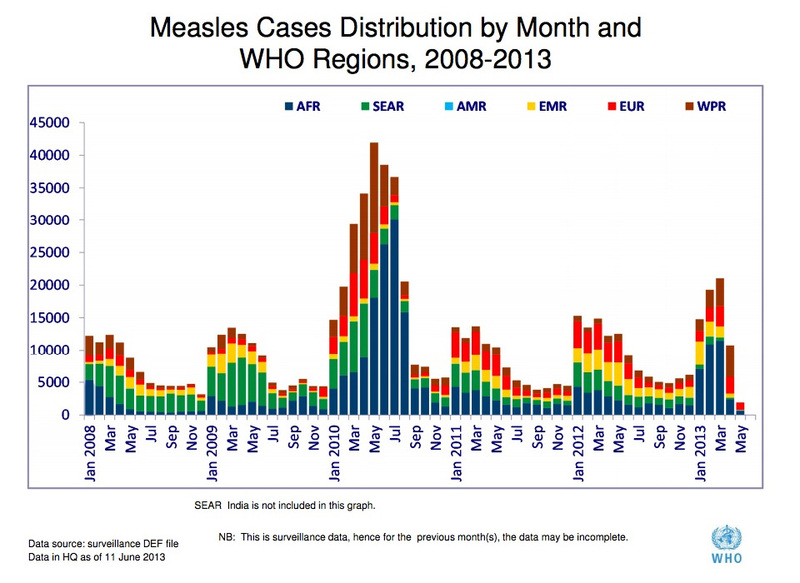 We’ve reported on the Western Pacific region’s recent success against measles. According to the latest published reports, most of the region’s countries are recording either zero cases, or a fraction of the cases of 2012. China however is reporting twice as many cases so far this year as it had in all of 2012, and the Lao PDR is also reporting an increase. In measles control there are also some blind spots. Due to its sheer size, pockets of low routine immunization coverage and based on previous expert estimates, India likely has ongoing measles outbreaks, but hasn’t yet established a nationwide surveillance system. Case counts published annually are not always reliable. WHO’ published estimates showed that about a third of the people who died of measles in 2011 lived in India. Elsewhere in the South-East Asia region Bangladesh, Indonesia, Nepal, Myanmar and Thailand have reported notable numbers of cases this year. The Americas have been declared free of indigenous measles since 2002 and the last case of indigenous rubella was in 2009. The risk of these viruses today comes with infected people arriving from other countries – whether visitors or returning American travelers- who come into contact with people who are not immune. The New York health department is reporting a measles outbreak in Brooklyn, New York, affecting more than fifty people in the Orthodox Jewish community. Because so many cases are in infants and children the health department is recommending that six-month year old infants in that community be vaccinated. While cases of rubella are common in many countries that have not yet introduced a rubella-containing vaccine, two countries – Japan and Poland – are experiencing particularly notable outbreaks. Rubella causes a mild illness in infected people, but for pregnant women, the virus can be devastating. A woman infected in her first trimester has an 85% chance of giving birth to a baby suffering severe birth defects, including heart, eye and hearing problems, known as congenital rubella syndrome. Rubella infection can also lead to miscarriages and stillbirths. In Japan, a large, growing rubella outbreak has mainly affected unvaccinated men in their 20s and 30s and more than 10,000 cases have been recorded so far this year. The tragedy is that pregnant women have also been affected, and 10 babies have been born with congenital rubella syndrome since October 2012, with the risk of more cases for women who are pregnant and yet to give birth. In Poland, a rubella outbreak has led to more than 26,000 cases, spread throughout the country with a majority of cases in the western region. In response, the CDC has taken the rare measure of issuing a travel alert with specific advice for pregnant women. The CDC is recommending that pregnant women who are not protected against rubella either through vaccination or previous rubella infection should avoid traveling to either Japan or Poland during these outbreaks. CDC notes this is especially important during the first 20 weeks of pregnancy. For a full look at measles to date in 2013, take a look below at the WHO’s epidemiological graph of measles over time from 2008-2013. The quick takeaway is that with 2.5 short years to go to 2015, measles cases in 2013 are moving in the wrong direction, with more cases this year than at the same point in 2012 or 2011.